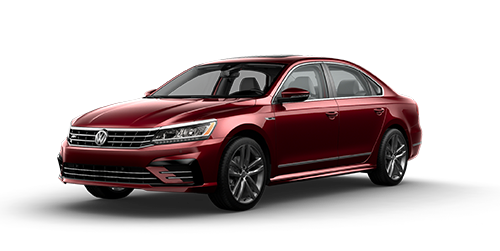 Joe Machens Volkswagen is proud to provide the new 2019 Volkswagen Passat to Jefferson City and Sedalia, Missouri area drivers. This new mid-size sedan boasts an available Adaptive Cruise Control, Rear-View Camera System, NHTSA 5-Star Safety Rating, and Intelligent Crash Response System. Protect your precious cargo with Automatic Post-Collision Braking System and Tire Pressure Monitoring System. When you want to give your daily commute an upgrade, climb into a new Passat with R-Line interior, R-Line exterior, and LED Headlights. Step up to the Passat SE R-Line to enjoy an interior that boasts a Fender® Premium Audio System, paddle shifters, and unique carbon fiber accents. Don't forget the new car smell. Walking around the exterior, your eye will catch the sporty front end, 19-inch twin 5-spoke alloy wheels, and performance design elements. To give your drive a significant upgrade, take a look at the Passat Wolfsburg Edition. Here, you'll find 17-inch, ten-spoke alloy wheels, advanced driver assistance features, and leatherette seats. The 2019 Passat is designed for the entire family to enjoy. Rear seat passengers will appreciate having more than three feet of legroom. You'll appreciate the hands-free easy-open trunk the next time our hands are full. Follow these directions to Joe Machens Volkswagen in Columbia, MO and enjoy an informative test drive. For 2019, the new Passat arrives in the Wolfsburg trim and the SE R-Line. The Wolfsburg is performance-oriented and motivated by a 2.0L Turbo engine. Enjoy such standard features as Blind Spot Monitor and Front Assist, VW Car-Net® App-Connect, and V-Tex leatherette seating surfaces. The SE R-Line comes with LED headlights, Touchscreen navigation system, and an Adaptive Cruise Control. Which new mid-size sedan will provide the family-fun you're after? When you're ready to make your purchase or find out if it's better to buy or lease, our finance associates will help with your Volkswagen auto loan. We look forward to seeing you at Joe Machens Volkswagen.